The orange in carrots and peppers is caused by a type of antioxidant known as the carotenoids. Beta carotene is the most commonly recognized carotenoid with the strongest anticancer activity. The lycopene in tomatoes is another example of a carotenoid. Leafy greens like kale, collards and spinach, as well as corn, eggs and citrus fruits contain the carotenoids lutein and zeaxanthin with less established cancer fighting attributes. Flavenoids are probably the world's favorite antioxidant. This category includes anthocyanins, which are found in cherries, grapes and berries. It also includes the flavanols found in dark chocolate and the proanthocyanins in red wine. Other sources of flavenoids include apples, broccoli, citrus, cinnamon, and some teas. Everyone knows vegetables are good for you. 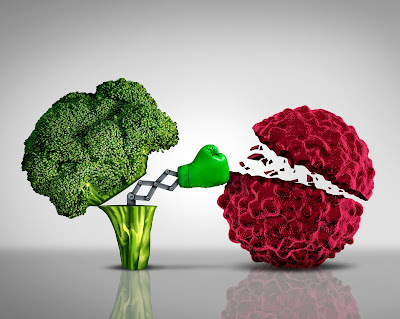 This is true for a lot of reasons, but in the case of cruciferous vegetables, like broccoli and cauliflower, this is at least in part due to the presence of isothiocyanates, a type of antioxidant. Kale, cabbage and horseradish also contain this detoxifying and cancer fighting antioxidant. Cruciferous vegetables also contain an important antioxidant group called the sulfides or thiols. These are also important to detoxification and healthy immune function, both of which help prevent cancer. Garlic, contains allicin, one of the most potent antioxidants and an example of a sulfide. To a lesser extent, onions, leeks, scallions and bok choy contain these antioxidants as well. Caffeic acid and ferulic acid are antioxidants of the phenol variety. These can be found in apples, pears, citrus fruits and some vegetables. It is believed but not proven that phenols contribute to antioxidant defense against cancer. They certainly promote circulatory and immune health, which alone helps make cancer less likely.